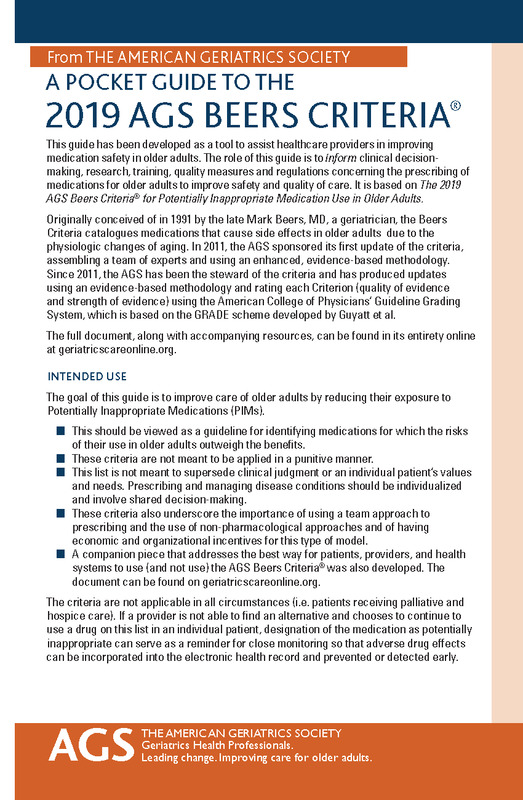 This clinical tool, based on the 2019 AGS Beers Criteria® for Potentially Inappropriate Medication Use in Older Adults, has been developed to assist healthcare providers in improving medication safety in older adults. Our purpose is to inform clinical decision-making concerning the prescribing of medications for older adults in order to improve safety and quality of care. Digital: 1-year digital subscription to access a printer-friendly downloadable PDF hosted on GeriatricsCareOnline.org. Print Single Card: Order up to 5 single laminated pocket cards (dimension of folded pocketcard is 4” by 6.25”). For an order of 6 cards or more, purchase a set of 25. Print Set of 25 Cards: Save when you order more. Each set includes 25 sturdy pocketcards (each folded pocketcard measures 4” by 6.25”). For digital pocketcard subscribers, a large-print version is available by emailing GCOinfo@americangeriatrics.org.